MINI isn’t the only one trying to cash in on the football fever in the run up to the FIFA World Cup in Brazil in June – Opel has just released its own special edition model, the Opel Astra Copacabana, which arguably goes even further to commemorate the event. Based on the Astra GTC, the Copacabana adds “dancing stripes” in Brazilian colours around the car, together with palm tree and football player decals. A Brazilian flag also adorns the roof. Inside, the seats feature real grass obtained from the Maracaña Stadium, the main venue of the World Cup – there’s even a certificate of authenticity that comes with the car. In the footwell, the usual mats are replaced by sand from the Copacabana beach in Rio de Janeiro, which gave the Astra special edition its name (no, not the Barry Manilow song). The IntelliLink infotainment system on the centre console can be used to stream all live matches during the World Cup or play football video games. The horn can be customisable – playing either Samba or vuvuzela tones – and there’s even a Caipirinha and crushed ice dispenser (alcohol-free, of course). 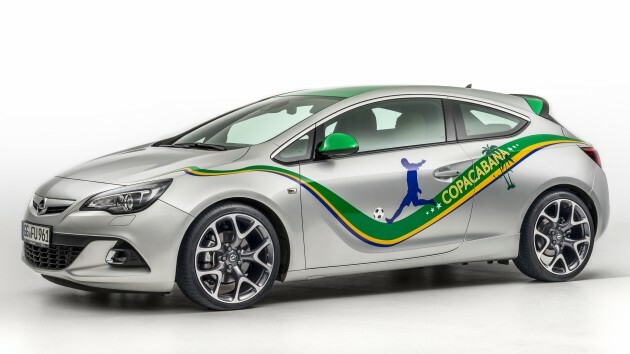 The company claims the Opel Astra Copacabana is “as Brazilian as Pelé and as German as Jürgen Klopp”. It is available at all Opel dealers today – April 1 – priced at €24,444. isn’t it a bit too late for april fool???? Wow, such rims, much fever, so amazing.. Wow..
Is this one of those 1st April joke again? Proton could come up with Proton Saga WorldCup edition. Apa macam? A hot Brasilian girl comes with the car as well? Cool. Hang on a sec honey, I’ve gotta water the car. wow, can fit Subaru XV rims even though not same pcd? the grass seat and beach sand carpet are truly installed or just a hoax?